On 19 December 2016 Veronika Liubarskaya handed over ten volumes of material evidence from the case-files of her father, the dissident and human rights activist Kronid Arkadievich Liubarsky (1934-1996), to the archives of International Memorial Society. 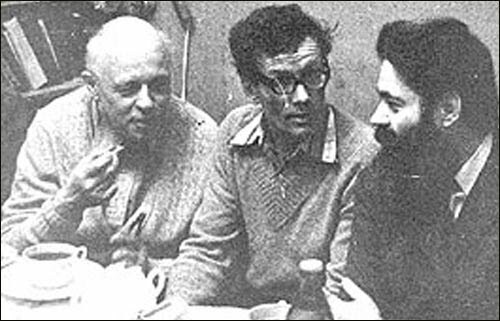 Kronid Liubarsky was arrested on 17 January 1972 and sentenced on 30 October to five years of deprivation of liberty in strict regime camps for human rights work and disseminating samizdat material. He was rehabilitated in 1996. They had seized from him a vast collection of samizdat - a library’s worth, in fact. It included not just typewritten pages, but also photocopies of books, which were given to Memorial’s museum several years ago. Of the 19 volumes relating to the case, 10 of them had been considered as ‘evidence’. These included issues of A Chronicle of Current Events, and the anthologies Noon, by Natalia Gorbanevskaya, and The Trial of the Four by Pavel Litvinov. In addition, part of these materials served the basis for announcements published in A Chronicle of Current Events, which gives us some idea about how the editorial board of the Chronicle worked. The employees of the FSB archives in Moscow and Moscow region did not want to part with this treasure trove. They said that since the court had not taken any decision on the documentary evidence in 1972, its status remained ambiguous, and therefore it needed to be reexamined by a court (44 years later!) for its final status to be determined. As a result, it was necessary to obtain the documents through the courts, which was made possible with the help of Memorial’s lawyers Tatiana Glushkova and Daniil Khaimovich. The position of Veronica Liubarskaya and Memorial’s lawyers was simple. According to Article 11 of the Law on rehabilitation, “Rehabilitated individuals and their heirs have the right to obtain manuscripts, photographs, and other personal documents kept in the files”. As a result, on 20 October 2016 Moscow Region Court ruled that the documents from the case-files should be returned to the person who had lawfully inherited them. Those materials that had not been considered incriminatory and had not been included in the indictment were given to the KGB’s internal library. Their recovery is a matter for the future.